Let's start with this video shall we? I loved the trailor of Burnt as soon as I saw it online. Unfortunately, I was not able to catch it when it came to theaters. The first day of the year being a weekend, we got ourselves the movie and settled in - spaghetti bolognese and chicken burger in hand to watch the movie. Bradley Cooper does an amazing job of playing the chef with a past that comes back to bite him in the hind quarters. Arrogant, confident, brooding, wild tempers - as Adam Jones, he does it all. The screenplay is a brilliantly layered one which picks up with Adam Jones looking to turn over a new leaf and connecting with everyone from his past to do so. 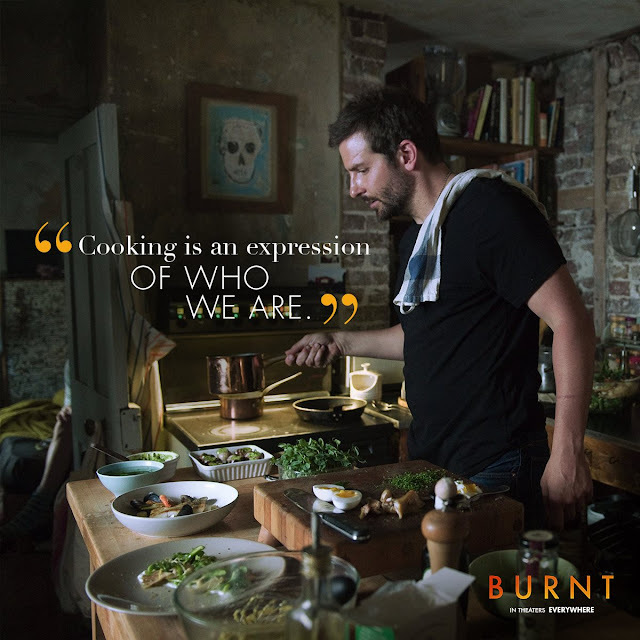 His equations with each of his co-stars is brought out in subtle past and present references and situations which gives you such lovely insight into the pressures and relations that the culinary industry can create. And then there is the treatment of food - it is never overtly discussed all through the movie, but you see it there - one gorgeously plated plate to another. You don't hear names, you don't hear ingredients, but what you do see are plates of food that receive final touches on the pass and you just want to dive in. All that beautiful food aside, it is the scene when the character Reece makes simple scrambled eggs with two knobs of butter, the pouring of orange beaten egg yolks and a swizzle of a fork that makes you want to drool after your spaghetti bolognese is sitting pretty in your tummy. Burnt is a movie that is all about food and what goes into its making with a generous dose of subtlety all through. As Adam Jones says in the movie - its not about making great food, its about making food that gives you culinary orgasms!